Race 2 MRG Genk - De website van onroad-electro! 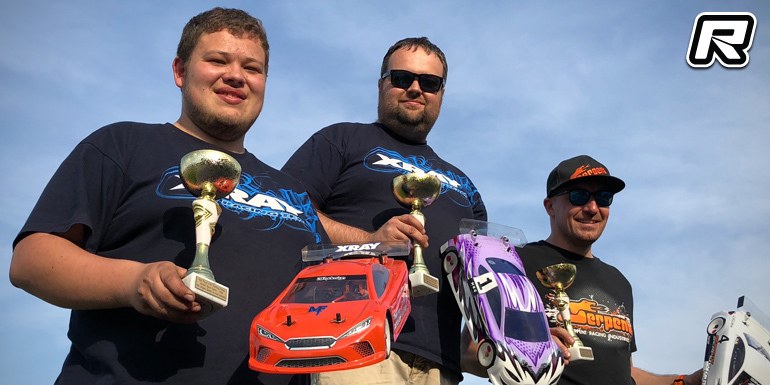 The second round of the Belgian FBA Electric On-road Nationals took place over the weekend at the MRCG club in Genk. The fast and flowing track is located in a motorsport heaven with a karting and a motocross track in the near neighbourhood. Practice was held on Saturday with the warm and sunny weather making for lots of action on the track. Unfortunately some drivers opted to not start due to not liking the grip provided by the new Voltante spec tyres. In the premier Touring Modified class speeds of over 110km/h were achieved, whoever the traction available was ideal for the swift cars and so some drivers opted to use different motor windings for the race in order to cope with the conditions. No one was in doubt that Olivier Bultynck (Awesomatix) would claim the pole position, however former European EFRA Stock champion, Rémi Callens (Team Magic), came quite close during his second run. In the end, he had to settle for 2nd in front of Mitchell Van Es (Awesomatix), Thomas Stockman (Xray) and Florian Joos (Xray). Q3 was not run by most drivers because of a torrential rain that flooded the track. Before the finals, the track was dry, but the grip levels were a bit lower than before. In these difficult conditions, Ollie Bultynck was in a class of his own, claiming an easy victory. Mitchell took profit of a mistake made by Rémi Callens to claim the 2nd position. Despite setting the single fastest lap time of the race, Rémi had to settle for P3, just in front of Florian Joos, who was hot on Rémi’s heels during the last couple of laps. Rico Claeys (Schumacher) rounded off the top 5. In A2 Ollie yet again exploited his pole position to the max to win the second A-main and the overall event. Mitchell Van Es finished on a fine 2nd position, after having disposed off Rémi Callens. Thomas Stockman (Xray) finished in 3rd, just in front of Florian Joos and Rémi Callens. For A3 and just at the end of A2, the heavens opened again, and it looked like the race day was over. Rémi Callens decided not to wait for a drying track and went home. With Ollie Bultynck sitting out A3, the grid looked a bit deserted. Just before the start, Athan De Wittes car developed a problem and a 10-minute delay was requested. Unfortunately, the youngster had to start from the back of the grid according to the rules but this ended the youngster’s hope for a good result. With so many drivers absent, the battle for the remaining podium spots would be decided in this final. Mitchell was running very strong in P1, with Florian some three seconds behind. Rico Claeys was however challenging for P2. Before the race, Florian did his maths. He knew he had to claim a P3 and stay in front of Thomas Stockman to get a P3 overall. When Rico challenged Florian for the position, the youngster let Rico through but stayed in front of Thomas and Steve Lambrechts (Xray). In the end it would work out for Florian who would take the final podium spot behind winner Olivier and runner-up, Mitchell. The Stock class would yet again see a battle between the two Xray drivers Giovanni Moguez and Vincent Van Gansen. The MRCG track was the first race where Giovanni claimed his maiden victory in an A-main leg in 2017, so he was to keen to claim his first victory here. The qualifiers were run in a hot and sunny weather and were super tense. Giovanni claimed pole by only two tenths of a second over the reigning champion Vincent Van Gansen. Xavier Debroye (Awesomatix) led a freight train of another six drivers within three seconds. P4 went to new-to-the-class Steve Deblaere (Serpent) while Tom Adams claimed an excellent 5th with his Schumacher). The first main was held under slightly damp conditions, so many drivers made last minute setup changes to cope with the new track conditions. Giovanni Moguez exploited his pole to the fullest and shot off, punching constant 19 seconds laps. Because of the weather conditions, Vincent opted to run a bit more toe in in the back, but he was unfortunately heavily penalised, as he couldn’t follow Giovanni’s pace. While everyone was watching the battle for P3 between Xavier, Steve and Peter Degrande (Infinity), Giovanni made a rookie mistake and rolled his car. This handed the lead to Vincent. Giovanni, who was mad with himself, punched some great laps out and came back within Vincent’s slipstream. Vince kept his cool and claimed victory by 0.2 tenths of a second. Steve Deblaere took a great P3, in front of Xavier Debroye and a fast charging Peter Degrande, who fought his way back from P8 on the grid. Giovanni probably thought that A1 wasn’t exciting enough, so he decided to write another scenario for A2. While taking yet another perfect start, he under-steered out of the corner at the end of the straight and had to let Vincent and Xavier through. He first disposed of Xavier and then made a great pass on Vincent, when Vincent ran a bit wide in the corner proceeding the main straight. Vincent kept the door open, and both continued till the finish in the same order. Steve claimed P3 again, in front of Xavier and Peter Degrande. Everyone wanted to witness a thriller of an A3, but it was cut short when a backmarker hit Vincent on lap 1 and ended his victory aspirations. Giovanni claimed A3 in style to win his first Belgian national in the Stock class. He was followed by an excellent Xavier Debroye, Steve Deblaere and Vincent, who recovered from a body tuck that cost him six seconds. Niels Meurs claimed P5 with his Destiny. The overall result was Giovanni Moguez (Xray), Vincent Van Gansen (Xray), Steve Deblaere (Serpent), Xavier Debroye (Awesomatix) and Peter Degrande (Infinity). In Formula and fresh from claiming his second ETS victory in Madrid, Ollie Bultynck was keen to repeat his performance in the Belgian Nationals as well. It was however Serpent’s Steve Deblaere who got the most out of his car and claimed pole position by five seconds over Ollie. Patrick Jongenelis (Xray) claimed P3 and was followed by Nicolas Delisé (Roche) and Kris Vanbleu (Xray). Things were to change before the finals however. Just before the 3rd and last Modified qualifier, the heavens opened and it started to pour rain. Thanks to the warm and sunny conditions, the track dried up and the first race could be run on a slightly damp track. Unfortunately, Steve ran a bit wide on the first corner and couldn’t exploit his pole position. Ollie took the lead and held it until the end, despite a bumper to bumper race with Steve. Patrick Jongenelis claimed an excellent 3rd, not too far off the leading duo. The Xray duo of Eppo Cleiren and Kris Vanbleu took 4th and 5th respectively. In A2, Steve took the hole shot and already had a 1-second advantage over Ollie after two laps. When he ran a bit wide in lap 3, he collected dust on his tyres and spun out while accelerating. This promoted Ollie into the lead, which he was able to hold onto till the end. Nicolas Delisé (Roche) won a hard-fought battle against Patrick, with Steve not too far behind in 4th. Kris Vanbleu finished in a fine 5th position. Before A3, the heavens opened again, and the track was now mostly damp when the cars set off for their A3. The pace during the opening laps was pedestrian. If a driver only accelerated a bit, the cars simply spun out. There were some nice duels, but they were taking place at 5km/h. When the track gradually dried up during the 8-minute final, the lap times dropped from one minute to around 30 seconds. 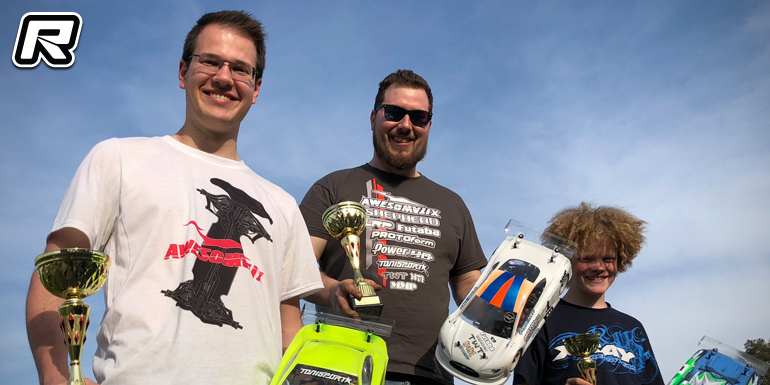 The last final was won by Nicolas, followed by Steve, Kris Vanbleu, Patrick Jongenelis and Florian Joos, who had a nightmare of a race day as he was unable to get the slightest amount of traction out of the new spec Volante tyres. The overall ranking was Olivier Bultynck (Shepherd), Nicolas Delisé (Roche), Steve Deblaere (Serpent), Patrick Jongenelis (Xray) and Kris Vanbleu (Xray).